Racing and Wagering Western Australia (RWWA) is a responsible gambling organisation that provides a major source of funding for the development of racing and sports in Western Australia. RWWA engaged Planit to help meet a strategic priority to increase their share of the competitive wagering market through enhanced products and services, by ensuring a heavy focus on testing for their biggest day of the year – the Melbourne Cup. "We selected Planit as they are the preeminent test resourcing company with an outstanding reputation and a local presence. We knew Planit from their annual Testing Index which is both insightful and useful. Far more than just a value-add for Testing industry leaders, it takes metrics across the IS landscape that assist understanding what delivery and testing approaches are delivering best results. Planit is an integral part of the testing community in WA, as a sponsor of events such as TestWest and SiGIST meet-ups, and as such they are relied upon and valued for their thought leadership and networking. "The benefits of having Planit as our testing partners are evidenced in the lead up to the Melbourne Cup and the resultant performance on the day. One month before the Melbourne Cup, as Planit was running the testing, a significant problem was found by the test tools they had implemented and the implications of that problem would have been major had it happened on Cup Day. It was a good news story because of Planit. "The technical test lead from Planit was experienced, knew our requirements well and was the perfect fit for us culturally. He gave an overview of our testing practice and produced a report of findings. It was a brutally honest assessment containing real and practical suggestions for improvement which we implemented using a blend of RWWA and Planit staff. His results were not only accurate, professionally delivered and well communicated but he empowered our team through generous knowledge sharing so that they could run and expand what he helped implement. "The unique tool built was to prepare us for our biggest day – The Melbourne Cup. This is the pinnacle of the racing year with customers accessing the internet, mobile and retail network of 330 shops. There are 300 transactions per minute on a normal race day. This increases up to 14,000 transactionsper minute on our big day. The cost to us of being down is up to $1,500 – per second. If we’re down for just one minute, that’s a loss of $80,000. "To this day we’re still using the solution Planit built and have expanded both its scope and complexity. Our Melbourne Cup performance tests for our TABTouch mobile web app and website are almost fully automated, permitting tests to be scheduled out of core business hours. In doing so, teams have greater availability to analyse, report on results and develop additional tests during regular business hours with support personnel available. "Automated and scheduled performance tests, coupled with efficient use of testing infrastructure saves time testing and thereby improves our speed to market with less risk of failure than would otherwise be possible. "We can now prepare for that day using very low-to-no cost open source tools that can realistically simulate Melbourne Cup customer activity and assess if all our systems can meet the demands of the day. We can repeat these tests anytime and with Planit’s assistance we have significantly driven down the cost of test tools and have increased the reliability of tests and accuracy of test results. "This is risk mitigation, continuous improvement and cost reduction planning in action. The performance results uncovered a significant performance opportunity, that once addressed, resulted in a doubling of the number of account signup volumes all while avoiding costly infrastructure upgrades. 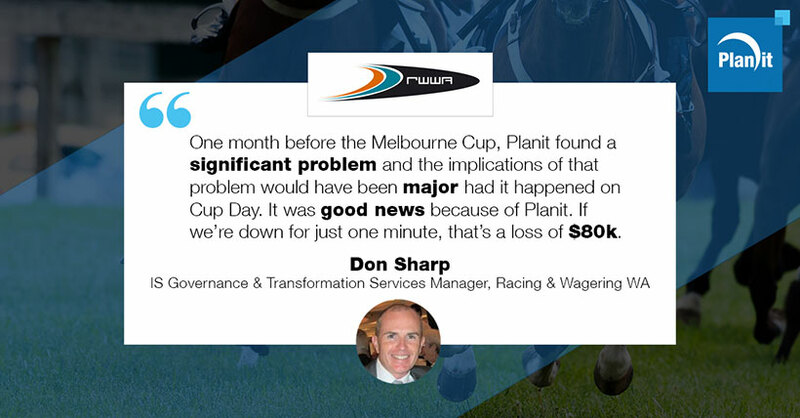 As a result of Planit’s assistance, our customer experience on Cup Day was far more responsive and reliable."